These are really really tasty! 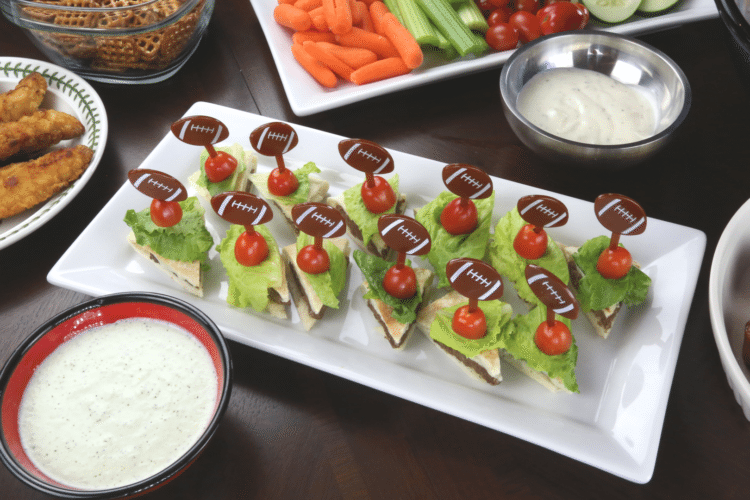 Looking for a tasty football party or tailgate appetizer that will leave your guests asking for more? You need to try these easy mini gyro sliders paired with homemade tzatziki dipping sauce. Traditional tzatziki sauce is a Greek staple made from strained yogurt, cucumber, garlic, olive oil and red wine vinegar. It’s often served on gyros, with chicken, on a burger (beef or lamb) or as a dipping sauce for pita bread and veggies. I’ve even tried putting it in mashed potatoes—and was pleasantly surprised at the light and crisp flavor the cucumber, dill and lemon gave the standard dish. Peel, seed (I like to use a melon baller to scoop out the seeds) & dice the cucumber. In a food processor, combine the yogurt, cucumber, garlic, lemon zest, lemon juice and dill. Blend into a nice, smooth consistency. For best results, chill 1 hour before serving. 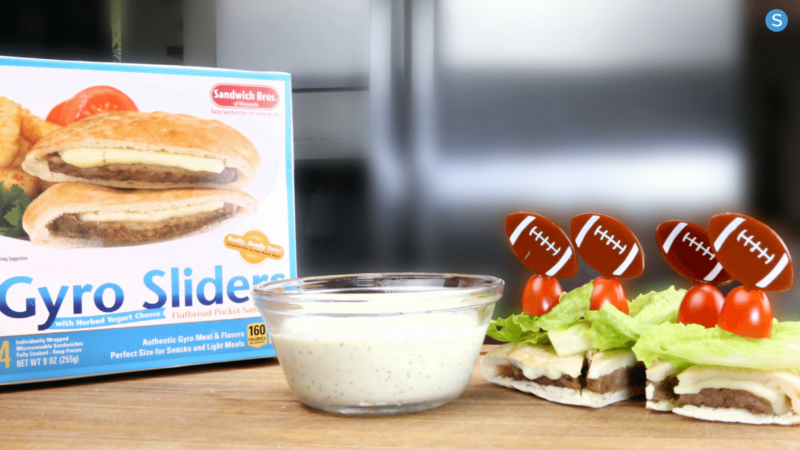 Now, to score a touchdown at your next party, you need to pair the tzatziki sauce with these mini gyro sliders. And don’t worry, I’m not asking you to make gyros from scratch! SANDWICH BROS has already done all the hard work for you. Simply heat a few of their Gyro Flatbread Pocket Sandwiches in the microwave, cut into wedges, and skewer with 1/2 of a cherry tomato and piece of lettuce. Arrange on a plate next to the dipping sauce, and you’re all set. Packed with protein and lower in fat than a traditional bag of chips, SANDWICH BROS Flatbread Pocket Sandwiches are a great alternative to snacking. For my busy family, they are our go-to when we have a packed schedule, no time to cook and need to run out the door with something to tide us over until the next (inevitably later-than-planned) meal. Their snack line has four flavors: Angus Cheeseburgers, Chicken Melts, Gyro Sliders and Italian Sausage Melts. They also have a tasty breakfast line that has Sausage and Cheese, Egg and Cheese, Egg Whites and Turkey Sausage, and Turkey Sausage and Cheese Sandwiches. Yum!